If we get the chance to further refine this piece, we still might make a couple changes. I’d personally like to show something more of the ridiculous and wonderful journeys, perhaps including our instructions on how to get to these places, or making up instructions, both composed of geographic and bodily information. Similarly, I’d like to play more with language – looking at the language of medical treatment versus that of transport, bringing them into closer (and weirder) proximity than normal. In presenting this project, I’ve liked to retain an element of surprise – wanting to illuminate some of the key elements of the work, but letting the work speak for itself as much as possible. However, in blog format, as a document, I suppose I should really be as explicit as possible. 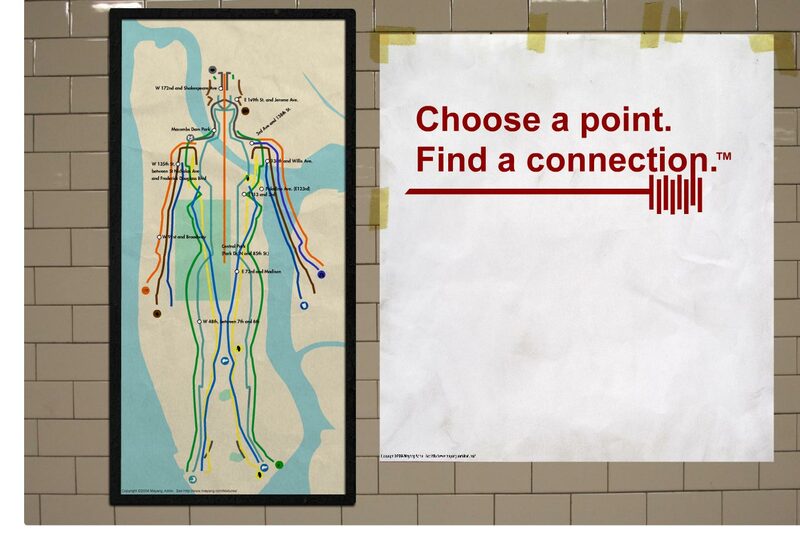 The work’s secondary tagline (the first is “Healing the body to navigate the city”) is less exciting, but more revealing – “Pathways’ is about exploring the unexpected connections between the practice of Acupuncture and the New York subway system. After considering our conceptual terrain until we were almost paralyzed with indecision, we returned to our first, instinctive visual connection, and extended it into absurdity – we directly mapped significant points along the twelve ‘meridian’ energy lines onto the manhattan map, and then, as accurately as possible (with the help of google maps, the MTA site and the opacity function in Photoshop), mapped those onto real world locations. And then we visited those locations – ‘random’ points, sets of coordinates, that often ended having a strange significance – at these exact spots, we found a school (at West 172nd and Shakespeare Ave) , a police station (east 169th and Jerome), a closed park (Macombs Dam Park, on the edge of the Bronx), and a tunnel (Park Drive North and East 85th, in Central Park), amongst others. There was something appealingly haphazard (but also oddly poetic) in the couplings of all these points (Bladder, Large Intestine, Heart, Kidney) and these places, and the project became an exercise more about disconnection and incongruency than metaphorical explanation and correlation, but this was something we greatly enjoyed, and wanted to preserve. 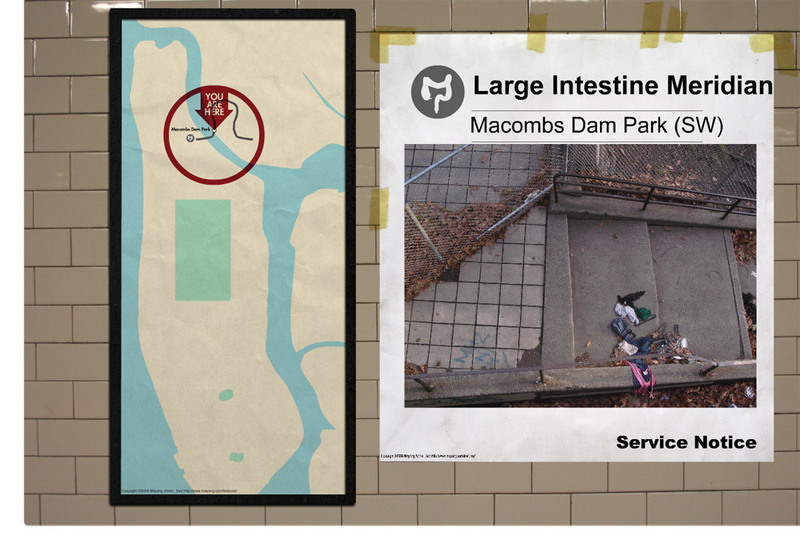 Tagline: Heal the body to navigate the city – Exploring the unexpected connections between the practice of Acupuncture and the New York subway system. “Pathways” involves an acupuncture doll that responds to the insertion of ‘stylus’ needles by displaying geographically concurrent points on a New York subway map, remapped to the 12 ‘meridian’ energy paths of traditional Chinese medicine.